Hydrox is a fast oxygen releasing disinfectant which is based on stabilised hydrogen peroxide , mineral acids and anorganic phosphates. On degradation the product releases vast amounts of oxygen which will destroy or irreesversible inactivate specified fungi and bacteria on hard surfaces. The product is non-toxic, and does not form harmful organic compounds as in the case of halogens. Oxygen release is non-irritant and it is therefore safe to apply the product manually in closed and poorly ventilated areas. It is safe to use in kennels,pet stores, shelters, stables, greenhouses and toilets. Object surfaces may be treated by brushing, or spraying. Use dilution: 1.0%- 5.0% will provide 0.3% -1.5 % active oxygen. The efficacy of a chemical used for sanitizing or disinfection rests upon its ability to penetrate or solubilise the organic biofilm that forms on hard surfaces. Biofilm provides ideal conditions and nutrients for microrganisms to grow and multiply. 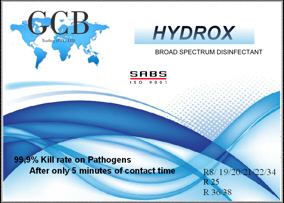 Hydrox has a limited ability to dissolve or soften the biofilm. Before disinfection it is important to preclean a surface or object that has multiple layers of organic deposits like oil,fat and protein with a suitable detergent or degreaser. After cleaning the surface it should be properly rinsed with clean water to remove detergent residue. Apply Hydrox after the rinse step at the recommended dilution. Inadequate removel of organic layers of fat,oil and protein will impair the performance of any sanitiser or disinfectant.